The base engine in the 2011 Charger is Chrysler's new 3.6-liter Pentastar V-6., which will be on SE and Rallye trim levels. DETROIT -- Chrysler Group, continuing its product overhaul, officially took the cover off the redesigned 2011 Dodge Charger sedan today. It is also one of the most aerodynamic Charger models ever, Chrysler said, with a lower hood line, faster windshield, more radically raked back headlights, tighter wheel openings, lower sill and a race-carlike flat underbody. Dodge said the car will go on sale this year. The Charger’s new front end includes a sculpted aluminum hood, redesigned front fascia and cross-hair grille, and new headlamps. In the back, the Charger receives a new taillamp design that stretches across the rear and uses 164 light-emitting diodes. The interior changes include a new steering wheel design with a thicker grip. Chrysler says the Charger's interior also has been tuned for better sound quality. The base engine in the 2011 Charger is Chrysler's new 3.6-liter Pentastar V-6., which will be on SE and Rallye trim levels. The Charger R/T will have a 5.7-liter V-8. All-wheel drive will be offered again as well. 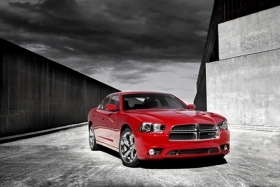 And for the first time, Chrysler said, several safety and security features will be available on the 2011 Charger. They include adaptive cruise control with forward-collision warning, blind-spot monitoring with rear cross-path detection and a rear backup camera with grid lines.